One more thought about what I saw in Istanbul last month that pertains to our situation here in Baltimore. Many have said that Baltimore would benefit from significant population growth to provide both a market and tax base for revitalizing the huge swaths of the city that are partially abandoned. Sounds good to me. While we’re at it, we need jobs that do not require a high degree of education but pay a living wage. We need a business plan to put money in people’s pockets in a post-industrial era where the middle class is disappearing. In the 1950s the Turkish began to invest in ways to promote street-level activity and commerce in Istanbul. An example is Taksim square which is at one end of Istiklal Cad (Cad means street): a kilometer-long, pedestrian zone lined with establishments on both sides—often every 15 feet or so. Oh, and no cars; instead, a streetcar runs the length of it. It’s one of several market districts scattered around the city. What’s most interesting about it is this: it’s where people go. They just go there—to the street, just to stroll with their buddies and fellow Istanbullas. They don’t necessarily go to a particular restaurant—though there are hundreds, nor to a certain shop or café, though they are everywhere. Instead, they grab their boyfriend, or mother, or kids, or grandfather and just go out on Istiklal. They walk and visit with each other and thousands of others. 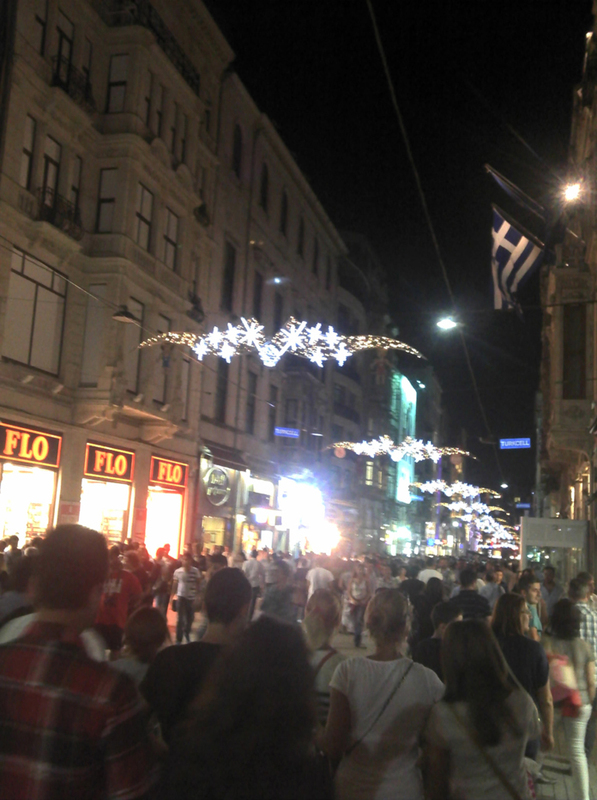 You can go to Istiklal at 9 pm on a Tuesday and the place is swarming. 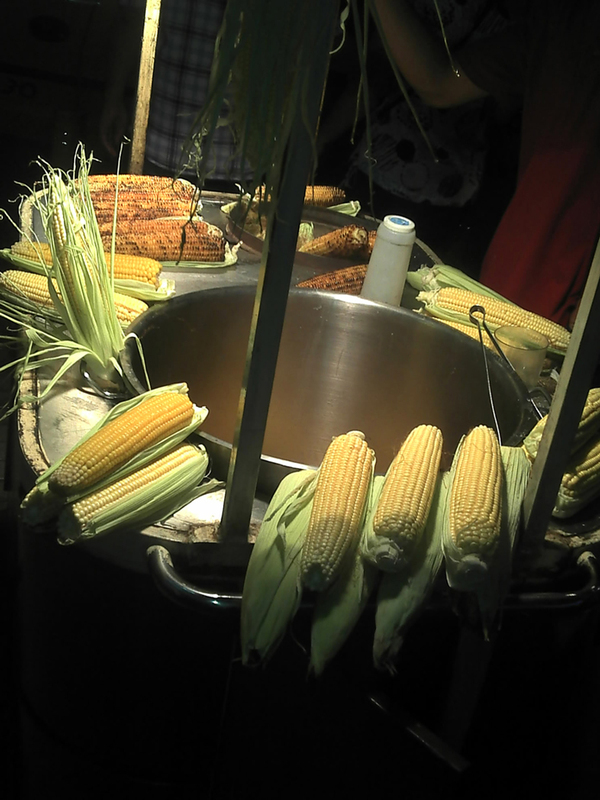 People, shops, ice cream parlors, street vendors selling grilled corn and muscles with lemon, bars and restaurants line the side streets. The fronts of most places are open to the street; there are few doors. The only way you can tell you are now “in” a restaurant is that the density of tables has increased and when you look up, there’s a ceiling. The amount of commerce going on is incalculable. Richard Florida would not be able to contain himself. And it’s all small establishments—wall-to-wall micro-businesses. They seem to be thriving but I doubt shop ownership requires a college degree—not that it is not skilled work; it is. Compared to the service I often find here, shop owners are extremely attentive, shops look great, service is excellent and so are the products. They make no bones about their desire to sell you what they have. So, did you ever just want to go out? Just to leave the confines of home or work and just be out—strolling among others? Imagine combining all of Baltimore’s restaurants, the farmers market and the crafts fairs and leaving them open, day and night, seven days a week. You don’t go out to eat, you go out to be part of something. When you get hungry, or thirsty, or want some ice cream you stop walking. You look around and move a few yards to the closest place and it’s lovely. On a design level, a lot of this is about proportion. It’s about the width of the street (wide) compared with the density of shops (lots). This design is generous to the people and their experience. Even Harbor Place is wrong in this way. However, imagine North Avenue from the 83 underpass to at least Greenmount Cemetery, closed to cars but with establishments packed in, lining each side. They don’t have to sell gold jewelry or be 4-star restaurants—just cookies, handmade stuff, photographs, shoes, or services like sharpening your scissors, or mending your shoes, or telling your fortune. And we need buskers—at least one every 100 yards. Oh, and art galleries are on the upper floors and the work is A-list international as it is on Istiklah. If you are interested in investing in jobs and commerce in Baltimore, call me and we’ll take a little trip to Istanbul together. The Greater Baltimore Metropolitan area has about 2.5 million—let’s remind them what cities are for.